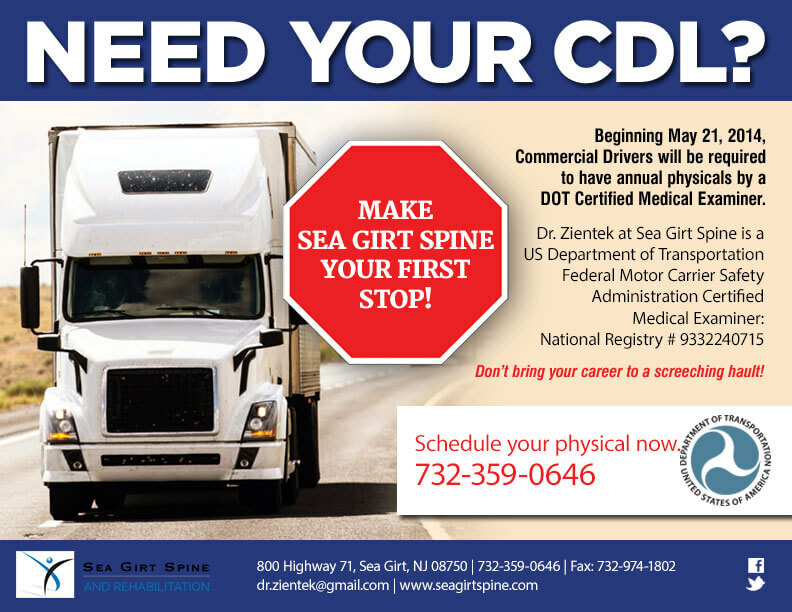 At Sea Girt Spine and Rehabilitation, we help drivers in need of DOT Physicals in Southern Monmouth and Northern Ocean County. STEP 2. Complete your DOT physical exam with doctor Mark Zientek, D.C. who is a medical certified examiner for FMCSA. Review of brief medical history. Height, weight, blood pressure, pulse rate, range of motion, breathing, eyes, ears. Urinalysis for basic urinalysis test. Payment is $125.00, mention this ad for a $25.00 discount. Pre-authorized company accounts are welcomed. Walk-ins are welcome, but to ensure we’ll be available at the time you want, call (732) 974-7500 to set up an appointment with Dr. Zientek for your DOT Physical exam. Contact us at Sea Girt, NJ Center. Repetitive strain injury builds up over time in long distance drivers. Many drivers come in to see us with back pain. One of the injuries Dr. Zientek sees often is ‘truckers shoulder‘. Others come in with hip and leg pain. Chiropractic adjustment is a key treatment Dr. Zientek uses to help patients get out of pain and improve their ability to perform their work. Our clinic has Chiropractic, Massage Therapy, Acupuncture, Physiotherapy to help you get out of pain quickly. If you have pain, ask Dr. Zientek about it. If he can help you he’ll tell you! If it’s not a condition he can help, he’ll tell you that too! At Sea Girt Spine and Rehabilitation, we do DOT Physical Exams. Quick, accurate, and hassle free. No appointment necessary. Walk-ins are welcome, or call (732) 974-7500 to guarantee a time that works for you. Your DOT doctor at Sea Girt Spine and Rehabilitation is Dr. Mark Zientek. He has been working with Commercial Drivers for over 30 years. We have been working with commercial drivers for more than ten years so he understands the importance of you passing your DOT physical exam for your CDL. Our goal at Sea Girt Spine and Rehabilitation is twofold: To support you in protecting your livelihood, and to help you with improved lifestyle choices for your health and for your life. We do our best to help you prepare for your DOT physical exam and make your CDL medical certification as hassle free as possible. If you have any questions or concerns, please give us a call at (732) 974-7500 today!